"Their intention was to create a settlement. And this is what we believe we are looking at with this symbol - their clear intention, marked on the map ..."
Attached to the map are two patches. One patch appears to merely correct a mistake on the map, but the other - in what is modern-day Bertie County in northeastern North Carolina - hides what appears to be a fort. Another symbol, appearing to be the very faint image of a different kind of fort, is drawn on top of the patch. In a joint announcement, the museums said, "First Colony Foundation researchers believe that it could mark, literally and symbolically, `the way to Jamestown.' As such, it is a unique discovery of the first importance." 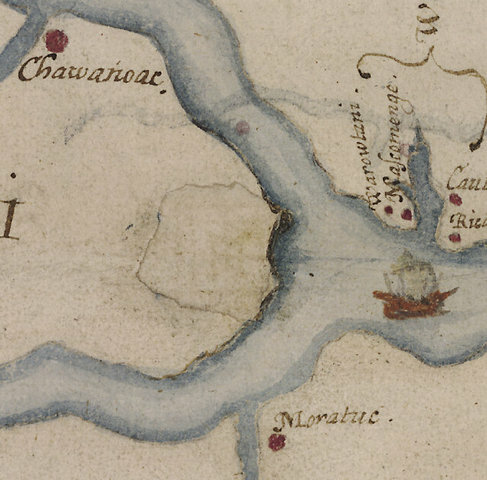 White made the map and other drawings when he traveled to Roanoke Island in 1585 on an expedition commanded by Sir Ralph Lane. In 1587, a second colony of 116 English settlers landed on Roanoke Island, led by White. He left the island for England for more supplies but couldn't return again until 1590 because of the war between England and Spain. When he came back, the colony was gone. White knew the majority had planned to move "50 miles into the maine," as he wrote, referring to the mainland. The only clue he found about the fate of the other two dozen was the word "CROATOAN" carved into a post, leading historians to believe they moved south to live with American Indians on what's now Hatteras Island. But the discovery of the fort symbol offers the first new clue in centuries about what happened to the 95 or so settlers, experts said Thursday. And researchers at the British Museum discovered it because Brent Lane, a member of the board of the First Colony Foundation, asked a seemingly obvious question: What's under those two patches? Researchers say the patches attached to White's excruciatingly accurate map were made with ink and paper contemporaneous with the rest of the map. One corrected mistakes on the shoreline of the Pamlico River and the placing of some villages. But the other covered the possible fort symbol, which is visible only when the map is viewed in a light box. The map was critical to Sir Walter Raleigh's quest to attract investors in his second colony, Lane said. It was critical to his convincing Queen Elizabeth I to let him keep his charter to establish a colony in the New World. It was critical to the colonists who navigated small boats in rough waters. Researchers don't know why someone covered the symbol with a patch, although Horn said the two drawings could indicate the settlers planned to build more of a settlement than just a fort. The land where archaeologists would need to dig eventually is privately owned, and some of it could be under a golf course and residential community. So excavating won't begin anytime soon. But it doesn't have to, said Nicholas Luccketti, a professional archaeologist in Virginia and North Carolina for more than 35 years. "This clue is certainly the most significant in pointing where a search should continue," Lane said. "The search for the colonists didn't start this decade; it didn't start this century. It started as soon as they were found to be absent from Roanoke Island ... I would say every generation in the last 400 years has taken this search on." But none have had today's sophisticated technology to help, he said.